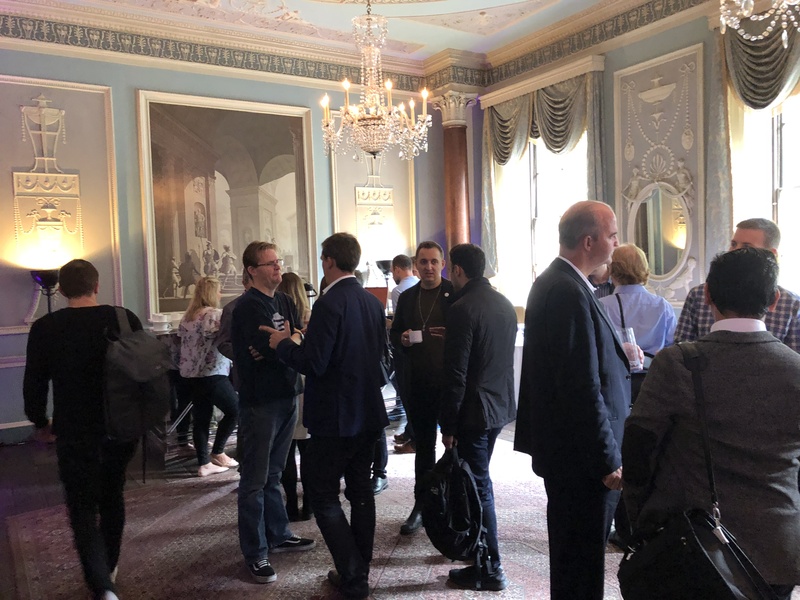 Our first Voice Summit was held at Home House London. The history of Home House is fitting because Anthony Blunt a former Russian spy lived there between 1947 to 1974. Blunt was given immunity from prosecution in return for a full confession. After extensive restoration work Home House became a private members club in 1996. 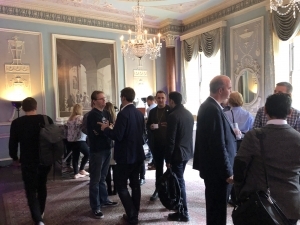 Home House was a fitting venue for Voice Summit. Just as Anthony Blunt listened into conversations Amazon Alexa and Google Home are listening and waiting for their wake word. The issue of privacy was mentioned at Voice Summit but the majority of the speakers stated that this would become less of an issue when the massive gains in conveniences are realised. After all it’s a lot quicker to ask Alexa to pour you a coffee, play the news and heat the car than it is to do this manually. Charles Cadbury the CEO of Say It Now demonstrated how he and his team had created a chat bot for SEAT for booking a test drive. Instead of the traditional web form or telephone booking appointment Charles took the audience through a series of questions with an Alexa Skill resulting in a SEAT car being delivered to a person’s home for a test drive. 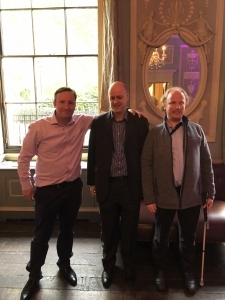 In the telecoms panel including Dean Elwood, Dean Bubley and Chris Lewis, virtual assistants for managing unwanted calls was discussed. Perhaps for unknown numbers a virtual assistant could ask an inbound caller qualifying questions to determine whether the line should be connected. Another idea was when you are on a call with another person the ability in the call to talk to a voice assistant for help. For example on a call asking Siri in the call what is 1 dollar in pounds and getting the answer. 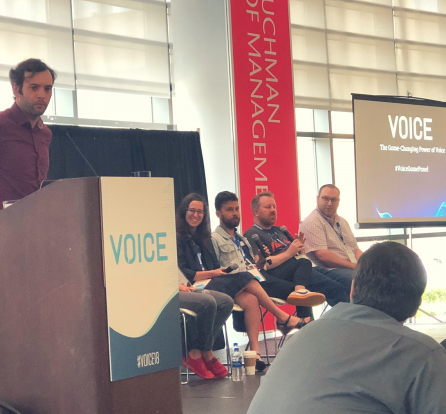 The consensus from the telecom experts was that large telecoms providers have been slow to market with VoiceFirst products and services and need to catch up. 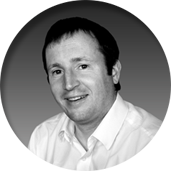 John Campbell, Head of SEO at We are Roast demonstrated there are still plenty of opportunities for Alexa Skills and Google Actions to drive leads and enquiries to your business or brand. The reality is voice technology is still in its infancy and every time you ask Alexa or OK Google a question it doesn’t know there is an opportunity to create a skill or action to service that need. Indeed voice search is predicted to be 50% of all internet searches by 2020. A traditional web search brings back many results whereas with voice there is only one result and this is position zero. Adopting a voice search SEO strategy can therefore get you to the top of Google and Amazon search results leading to lower customer acquisition costs. James Poulter rounded off the day explaining there has never been a more interesting time to be in the workplace. You now have four generations at work all with different social norms and ways of working. This is a real challenge for managers and leaders to get it right as they think about culture in their organisations. Ironically a voice first approach to internal communications can be good for both the silver surfers and the millennials! In a week where Google launched it’s Google Home Hub and Amazon it’s Echo Show 2 plus a range of devices such as the Echo Auto for enabling Alexa in your car, microphones are going to be everywhere. What remains to be seen is who will control the mic? Will it be Alexa, Cortana, Google Assistant or perhaps even Samsung’s Bixby. Will we make our car purchasing decisions for example on the type of voice assistants built in? And finally will voice assistants talk to each other so we have fridges talking to toasters? When a task is more natural, quicker and simpler with the voice, then a VoiceFirst approach should be adopted. This doesn’t mean a voice only approach as screens starts to become more prevalent in smart speakers and multi modal experiences become more commonplace. What is clear is that voice is here to stay and removing the friction of the keyboard or indeed the touch screen can lead to a more delightful experience for your customers. All of this leads to competitive advantage which will help you on your digital transformation journey. This entry was posted in Alexa, Amazon Echo, Uncategorized, voicefirst and tagged ai, alexa, smartspeakers, voicefirst on October 17, 2018 by Sean Gilligan. The competition is fierce. Why are the biggest tech companies in the world so focussed on the voice space? What is the motivation of companies? What are the voice assets? A battle for adoption, attention, authority and agency is in play. Smart speakers are moving faster than the fastest previous growth technology, the smart phone. We have just passed 50 million people using smart speakers in the USA. The number is up 20% from the start of 2018. This is not just a USA phenomena but it’s a worldwide pattern. It’s going into everything. Microphones will soon be everywhere. The question is what is behind the mic. The big tech companies want to be the voice behind the mic. Two thirds of users use smart speakers daily. Smart speakers are the gateway drugs to voice. People who buy smart speakers do not want to go back to life before. Smart speakers are sticky and have staying power. Once people are using smart speakers in the home people start thinking about using voice commands on their mobile phone. When you use smart speakers in a room with other people, what happens is the technology laggers learn from the adopters. 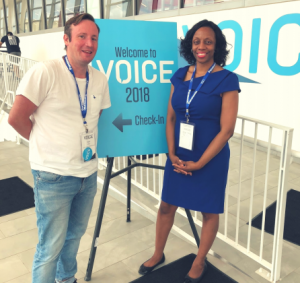 The founder of Modev and organiser of Voice Summit 18, opened the three day event. The keynote for the summit in Newark New Jersey was Dave Isbitski, the Chief Evangelist of Amazon Alexa. Dave himself had actually studied at New Jersey Institute of Technology in his formative years, so it was nice for him to return and address the audience of two and a half thousand people. 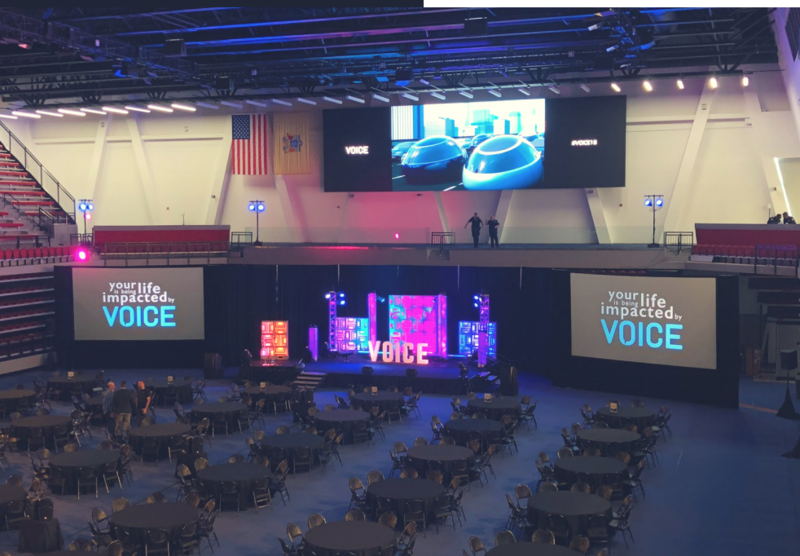 The new building that was hosting the main arena for Voice 2018 was the Health and Wellbeing Centre of NJIT, which opened six months prior. With voice controlled IT, after all, there is less friction involved and we can talk three times faster than we can type. Dave highlighted the explosion of the Amazon Alexa marketplace for skills reaching 45,000 skills to date. Skills are for smart speakers as apps are for mobile phones. The most popular skill on the Amazon Marketplace is a skill which plays sounds for getting people to sleep. There is also a skill for farting, which is quite popular obviously for humorous reasons. 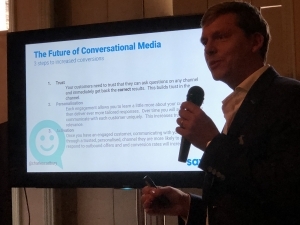 In another talk, Doug Robinson the CEO and Founder of Fresh Digital Group talked about the value of voice data for brands. Voice data is worth three to four times more than ordinary data because it has a person’s intent. Speed becomes a driving factor for consumers in the purchasing of products. Voice is an on demand channel through which users can instantly receive information and complete tasks. This expectation of immediacy surpasses e-commerce across all industry verticals. There is therefore a race against brand extinction. Instead, customers will move from trusted brands to trusted AI assistants. Brands need to ensure that they can guarantee they are part of your consideration when making purchasing decisions. Businesses need to train users to request your brand by voice in this new VoiceFirst world. Brands also need to think about how their brand sound. Big brands already have sonic jingle and we are familiar with these for brands such as McDonalds but all brands now need to be thinking in this way. We are on the start of the Voice First adoption curve. With over 100M Amazon smart speakers in US homes, connected cars with wifi and ability for drivers to control technology handsfree there are many compelling reasons to adopt voice. Smart speakers which are used in living rooms and kitchens are controlled by super users who then teach more novice family members how to properly utilise Alexa. People using Alexa in their kitchens with smart speakers then start to use voice on their mobile phones. All of this is helping to drive adoption and educate the consumer. Kids who can’t read are now asking Alexa the time and to play music or even set an alarm and Alexa has had to adapt to this by teaching children to be polite with magic words such as please and thank you. In the next five years we will be less dependent on the mobile phones in our pockets as we talk to voice controlled devices. We will be less glued to our screens and this will give us more time for each other in our jam packed busy days. Thank you for reading and perhaps you will attend Voice 2019 next year! This entry was posted in voicefirst and tagged alexa, conversation as a platform, smartspeakers, voicefirst on August 3, 2018 by Sean Gilligan.